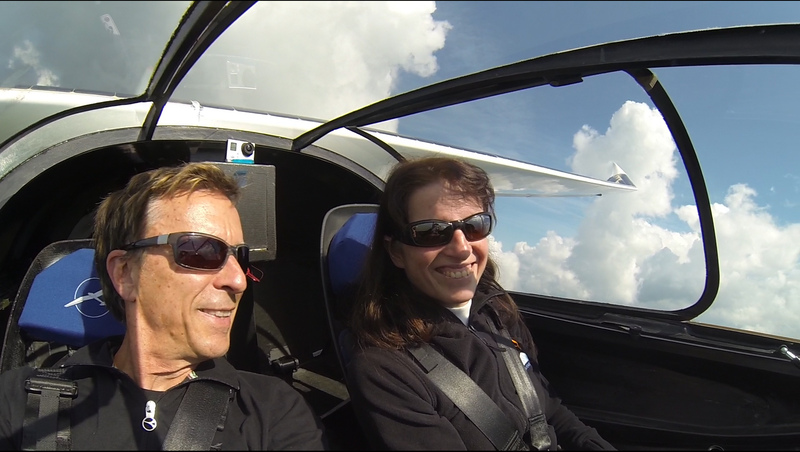 Irena Raymond became the first passenger of a solar-powered airplane recently, even taking over control of the Sunseeker Duo she and husband Eric built over the last several years. Her thoughts provoke awe and envy. With its 23 meter (75 feet) span and 20 kilowatt (26.8 horsepower) motor, the Duo may seem a bit unreasonable. Its reported empty weight of 660 pounds is lower than that of a 65-horsepower Piper J-3, though, and its low span loading helps it climb well on limited power. 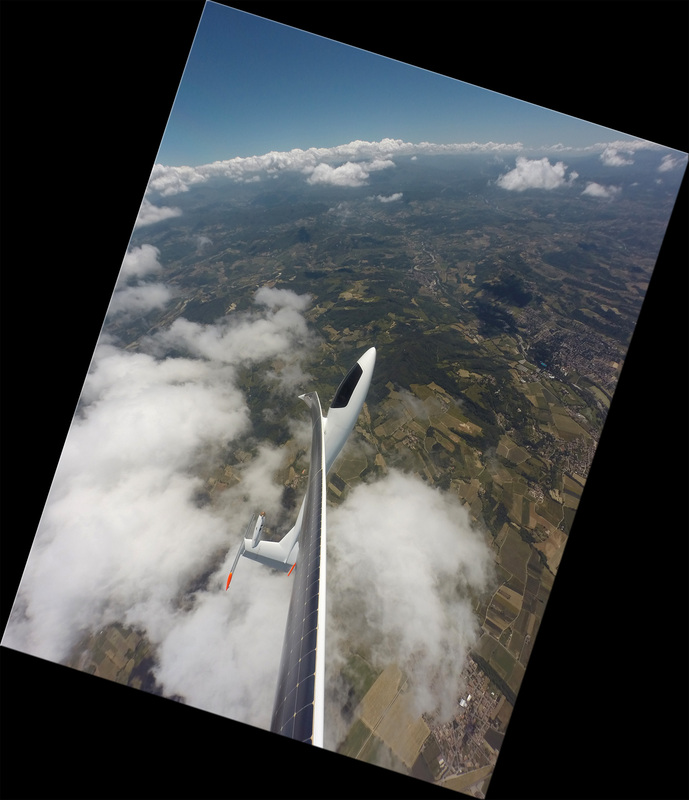 It’s flying at Light Sport Aircraft weight on the equivalent of an open-class sailplane wing. 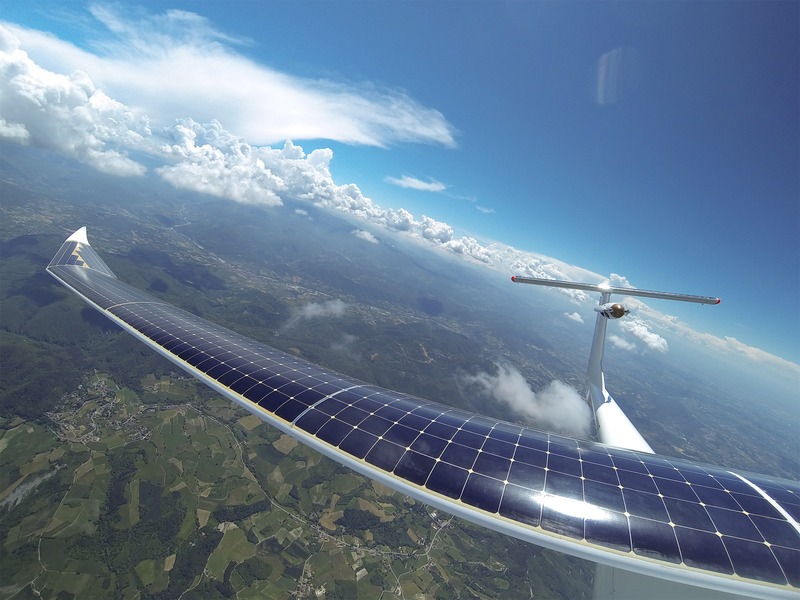 Its solar cells can charge the batteries after they’ve given 20 minutes of climb power, a good limit for an efficient sailplane, and one that can allow finding additional lift over a wide area. Eric’s success at squeezing high performance out of low power causes him to question the claims of others who promise more performance with greater weight, shorter span, or some combination of ingredients that equal less than plausible aerodynamic or electrical achievements. In a phone call a few months back, he suggested your editor should perform similar tests of reasonableness on the claims any aircraft designer makes for his or her craft. In Eric’s case, his unbroken stream of achievements shows his numbers are proof enough, and definitely part of the reality-based community. Despite its formidable span, the wing can be readily folded to allow storage in a conventional hangar, taking up a “footprint no larger than a Cessna 172. The airplane can also be quickly disassembled and packed into a custom trailer.” The latter was demonstrated when Eric and Irena hauled the airplane from her native Slovenia to its current airport home. The couple notes that the solar cells on the Duo are 50-percent more efficient than those used by Sunseeker II, which are efficient enough to allow that airplane to cruise in level flight on direct solar power. The Duo, they claim, can maintain a steady climb on sunlight alone, extending battery endurance. Its tricycle landing gear will make ground operations relatively easy, requiring no ground crew or wing-runners to assist in takeoffs. This practical level of operation will enable Eric and Irena to explore much of the world in sunny silence, a dream indeed. They will expand their cross-country experience soon, going on a 100-mile trip to a neighboring village, undoubtedly dining on the equivalent of an American airport hamburger. This could be the first zero-dollar airport lunch ever (food not included – but operating costs should allow ordering dessert). Amazing work. Keep doing that good job. I am a proud slovenian!